In last posts we shared some nice poems by Libai, here let me introduce who is Libai. 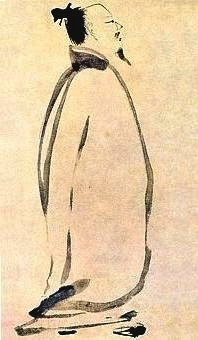 Li Bai (李白-Lǐ Bái) (701 – 762) was a Chinese poet. He was part of the group of Chinese scholars called the “Eight Immortals of the Wine Cup” in a poem by fellow poet Du Fu. Li Bai is often regarded, along with Du Fu, as one of the two greatest poets in China’s literary history. Approximately 1,100 of his poems remain today. The English-speaking world was introduced to Li Bai’s works by a Herbert Allen Giles publication History of Chinese Literature (1901) and through the liberal, but poetically influential, translations of Japanese versions of his poems made by Ezra Pound. Li Bai is best known for the extravagant imagination and striking Taoist imagery in his poetry, as well as for his great love for liquor. Like Du Fu, he spent much of his life travelling, although in his case it was because his wealth allowed him to, rather than because his poverty forced him. He is said, famously but untruly, to have drowned in the Yangtze River, having fallen from his boat while drunkenly trying to embrace the reflection of the moon. Over a thousand poems are attributed to him, but the authenticity of many of these is uncertain. He is best known for his yuefu poems and “Jinti shi” poems, which are intense and often fantastic. He is often associated with Taoism: there is a strong element of this in his works, both in the sentiments they express and in their spontaneous tone. Nevertheless, his gufeng (“ancient airs”) might adopt the perspective of the Confucian moralist.